Where can I find musicians and band members? 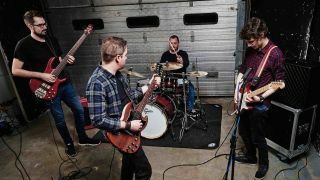 Finding band members is no easy task: good local musicians are often quickly snapped up, and as we all know, there's never any shortage of guitar players. To aid you in your quest, we've put together five options that should help you to pin down that elusive drummer/vocalist/bagpiper. A site dedicated to those looking to join and form musical collaborations. It’s free to sign up and you can immediately view the ads based on county. There’s thousands of ads so it's a good place to start. A lot of people now think of Gumtree first when they think of advertising online. It’s free to list adverts on here, and you can search by region in the Music, Bands and Musicians section. This app allows you to sign up and play music live online with others – rehearse with people you know or join open sessions for a jam with people at a similar level of ability. You can even record and broadcast your performances. We tried JamKazam out for a jam with guitar and drums (both with broadband connected via an ethernet cable) and we had a lot of fun using our onboard plugins such as AmpliTube with it. Another place for musicians seeking to collaborate, BandMix allows you to create your own profile, with audio if you choose, so people can hear what you’re about. Though you can set up a profile here to find other musicians and session work, it’s also a place for engineers and producers who are available for hire if you want to take the step to recording in a studio environment. Meet And Jam also organises jam nights in London to help people get involved.